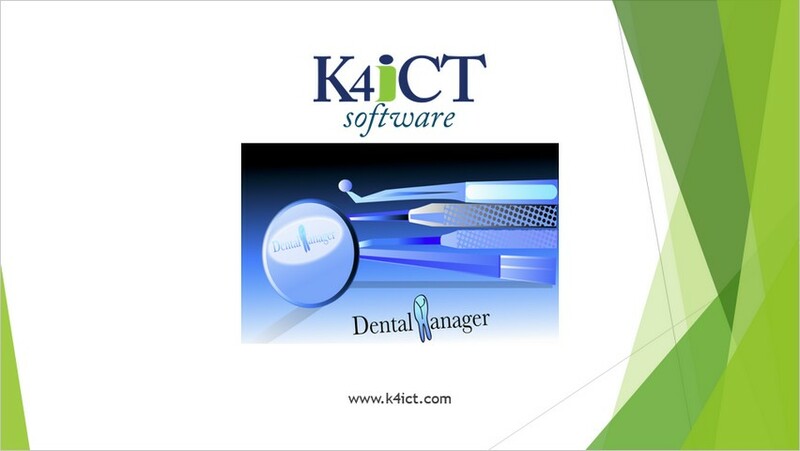 K4ICT Software made DentalManager, a software for dentist office management with which you can have patient folders with personal data automatically acquired through optical scanning, clinical documents, pathologies analysis, compressed and not compressed image acquisition, compressed e-mail sending in order to reduce download/upload times, captions, accountings, invoices, accounts given for any performance, appointment management, SMS and e-mail notifications, authentication-based panel visualization. Finally, the software permits to back-up all the data in local or removable storing devices. DentalManager has a very simple user interface, that permits to view and manage intuitively all the patient personal data, images, performances and invoices. With few simple steps, the user can take advantage of all the functions provided by the application. The Microsoft Office-style and panel-based GUI permits to the user to see each part of the software as a page, with which the user can show a single patient data or all patient data. Moreover, the panels are static and always visible, so that the user can switch between them instantaneously. DentalManager provides, for each panel, search-based filters for all the entities. For example, if the user is showing the Performances panel, he can use the relative filter in order to search the desired performances by type, date and patient name. All of this with few mouse clicks. Finally, DentalManager provides a very useful function, the optical acquisition, with which the user can create new patients or search existing ones, even from its health card. Do you want to watch a rolling-demo on software functions? Click on the following link to watch the rolling demo on YouTube. The video will show the most important functions of the software. Do you want to try our software on your computer? Go in the Download area and download the trial version, the brochure or purchase the full version of DentalManager.